Lot Detail - Ball's Bluff Era 71st Pennsylvania (1st California) Volunteers Archive. Ball's Bluff Era 71st Pennsylvania (1st California) Volunteers Archive. 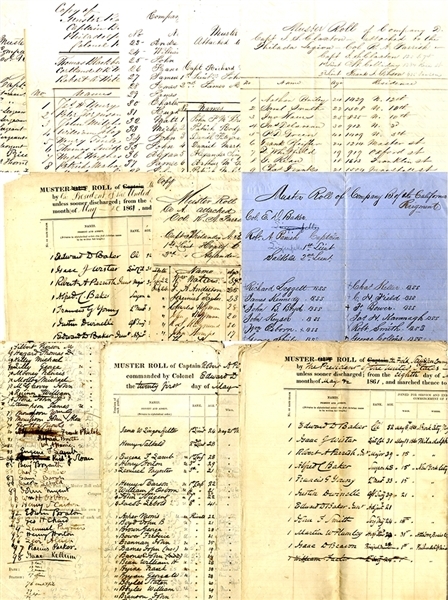 A great collection of eighteen (18) muster rolls and company registers mostly relate to Major Robert A. Parrish, Jr., 71st Pennsylvania Infantry. One document has been signed twice by Brigadier General Isaac Wister, as the lieutenant colonel, who was wounded in action at Ball's Bluff and Antietam while another document is signed by Major General William F. Smith as captain in the topographical engineer corps. Edward Dickinson Baker, US Senator from Oregon, was given special authority from President Lincoln to recruit a regiment at New York City. Baker was elected its colonel. Two muster rolls in this lot list his son, Edward D. Baker, Jr. as 1st Lieutenant and Adjutant and his brother, Alfred Baker, as Surgeon of the unit. Isaac Wistar was its Lieutenant Colonel, Robert A. Parrish, Jr., Major, plus other Lieutenants, assistant surgeons, etc. One of the muster rolls of Field and Staff is signed twice by Lieutenant Colonel Wistar. The regiment recruited 1100 men within a month during May and June, 1861. They were initially known as the California Regiment and mustered into service for three years. Until the Battle of Ball's Bluff the unit was treated as a regular Army unit. After the battle, in which its recruiter and Colonel, Edward Baker was killed, the state of Pennsylvania decided to claim it for its quota, and it became the 71st PA Infantry, and with other regiments formed the "Philadelphia Brigade/Legion." Robert Parrish would resign in July 1862. At Ball's Bluff, not only did the regiment lose Colonel Baker, but 312 of its 520 men in action. It fought at Fair Oaks, Chickahominy, Savage Station, Malvern Hill, among other Peninsular campaign battles. It saw action at the second Battle of Bull Run/Manassas Junction, reaching the battlefield near the end of the action. It was in reserve at South Mountain, but heavily engaged at Antietam, losing one-third of the men engaged, which it also lost at Fredericksburg. It arrived at Gettysburg on the evening of July 1, and over the next two days lost over half of its effective force. Later in the war it was engaged at the Wilderness and at Spottsylvania. Cold Harbor was its last battle, having served three years. Of a total of 2200 men, only 153 were able to muster out. These rolls mark the beginning of that career. There are two field and Staff rolls, as well as two for Co. B. Roll for Co. A (Capt. Fitzgerald, 47 men); another for Co. B, (Capt. J. Wright, 45 men); what appears to be a working sheet, with Co. B at top, but with 116 names. Also included are rolls for Co. C (38 men, Capt. Kochersperger); Co. D (44 men, Capt J. Claxton); Co. E (22 men listed, Capt. Richard Shults); Co. F (Capt. Blackburne, 42 men); Co. G (Capt. Hubert Price, 45 men); Co. H (Capt. Peter Summers, 32 privates, 7 officers); Co. I (Capt. Clem White, 44 men); Co. K (Capt. William White, 41 men, with attached small sheet). One with no company noted lists 85 men, including non-coms, and is signed by Robert Parrish. Another muster roll has a note from Parrish attached stating that "At the time of the original departure from Philadelphia Company 'A' of the California Regiment of Col. E.D. Baker - I certify that forty three of the men of Company 'B,' were carried off in the confusion attending their departure, and incorporated in Company 'A,' & that 8 additional were detailed from Compy. B to Comp. A in N. York." Also signed by Henry Salkeld certifying the same. Some have been used so heavily they have separated along folds. Most of the company rolls are very good, but the expected wear and soiling from "working" use.